Yellow Jackets are a paper wasp that makes a football-shaped nest either on the eve of our homes or in the ground with numbers estimated at twenty-five thousand at maturity. The queen usually starts her nest in mid-spring after emerging from hibernation. The nest is usually first noticed in midsummer as it nears maturity and the number of yellow jackets grows. They tend to become more aggressive late summer and early fall when they start producing new queens for the next year. Paper wasps are in a family of wasps that is given the scientific name of Vespidae, and another well-known group of wasps in this same family is our yellow jackets, which we often hear referred to as “meat bees”, due to the tendency for several of the species to try to share our hot dogs and hamburgers when we are yellow jacket eating outdoors. Paper wasps and yellow jackets are all social insects, creating a nest and organized colony, with a queen to lay the eggs and workers that care for the growing larvae and forage for food for the colony. The food of the larvae, as it turns out, is meat, and in the absence of humans and our own foods that meat will be natural sources such as other insects or carcasses of dead animals. Caterpillars are a particularly good source of meat, and in this respect, these insects provide some benefit to us. 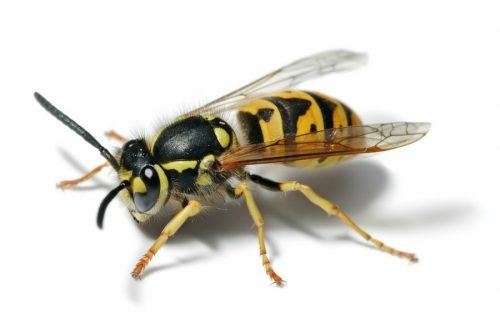 However, yellow jackets and paper wasps also can sting, and in defense of their nests will readily go after people or pets that stray too close for them. The European Paper Wasp looks very much like a yellow jacket, and could easily be confused with one. It is the same black and yellow color with very similar markings, but with a much more slender abdomen and somewhat narrower waist area. The nests of paper wasps also are different from those of yellow jackets. Both kinds of wasps create their nest by using dried plant materials, such as bark from trees, dried flower stems, etc., working this into a mushy paper Mache that they can then form into the rather beautiful nests with cells, where their larvae will live and grow. Yellowjackets nearly always enclose the nest with an outer shell, and their colonies can become extremely large, upwards of 25,000 wasps by the end of the summer if they have done well. Neither paper wasps nor yellow jackets continue the colony through the winter in areas where it gets cold, so all that work starts from scratch with a new queen creating a new colony in the spring. Paper wasps have much smaller colonies, with some of the largest getting only to about 100 workers in a nest. Rather than enclosing the nest they create it with the cells exposed and the nest hanging upside down, suspended on a thin stalk. The general appearance of this design gives rise to another name for these insects, which is “umbrella wasps”. That nest commonly is attached to the surfaces under the eaves of your home, within bushes, under the horizontal boards on your fence, within the garage or the attic, under or within motor homes or boats, inside light fixtures, and just about anyplace else these opportunistic insects can find that is secure and somewhat out of the way. Some species will even coat that stalk with a chemical that acts as an insect repellent, effectively keeping marauding ants from going after the eggs or larvae in the nest.